I am going off the beaten path here today. Instead of listing my Firefox Extension picks this week, I am going to highlight one particular extension. Like the Gmail HTML Signature extension I featured earlier, this Firefox extension deserves special attention. Site Launcher is an experimental add-on that is going to change the way you use Firefox. If you have used Enso or Launchy, you are probably used to launching applications with the help of a few hotkeys. Site Launcher extension brings you the ability to launch your favorite sites with a few hotkeys. This is a delight to use if you don’t like going to your mouse everytime to navigate. And if you are on the computer and Firefox all day like me, you are gonna love this. Site Launcher has a Manage Shortcuts screen that comes with a set of default popular sites like Gmail, Google Reader, Facebook, Flickr, etc. Each site is configured with a single character. 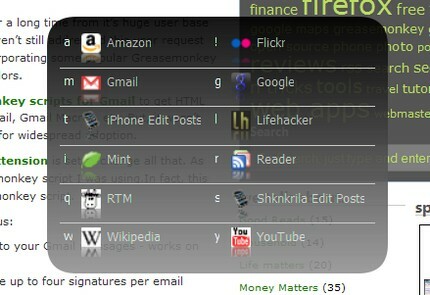 For eg: m for Gmail, f for Facebook, r for Google Reader, etc. Once configured, you can launch the Launcher window that shows you a screen with all the sites you have and the shortcuts. This makes it incredibly useful so you don’t have to remember the keys all the time. For instance, if you wanted to launch Gmail, you don’t have to click on the location bar or even CTRL+L and type the whole address. You just press CTRL+Space (you can change this) and the Site Launcher screen pops up. Now you press m to launch Gmail. In fact if you can remember the keywords for your most frequent sites, you don’t even have to launch he Site Launcher screen. Instead you can use the Direct to Site Hotkey to launch the site directly. For eg: Alt+Shift+m to open Gmail. Highly customizable appearance – screen color, text color, spacing, column size, etc. One thing that would make this awesome extension complete would be the ability to export and import settings. I use multiple computers and it would be nice to do all the setup in one computer and just import into others. Plus, it will serve as a backup in case I need to re-install Firefox. Although an experimental add-on, Site Launcher is heading straight to my list of Top Firefox Extensions. This sounds really great, I usually have my usual sites in the bookmarks toolbar and so I still have to navigate down a long list. Will definitely check this out. Is this really significantly better than just creating a bookmark for each of your favourite sites and assigning a one- or two-letter keyword to it? You then do CTRL+L (to put focus on the location bar), type the key letter(s), and hit the keyboard’s Enter key. It’s only very slightly less convenient than CTRL+Space plus key letter or Alt+Shift+keyletter, and doesn’t require you to install and configure an experimental extension. The extension’s ability to show you all of your favourite sites and their key letters at once is nice, but you can achieve the same thing by putting all of your favourite sites into a single bookmark folder or assigning a specific tag to them. In addition, since you’re using the sites often, you’d quickly remember the bookmark keywords you’d assigned to them and you wouldn’t need an easy reminder for them. Bookmarks are much easier to back-up and to migrate to a different computer, compared to extension settings (especially since this extension doesn’t (yet) have an import/export feature). Another added knowledge. I’ll check the actual usage of this launcher. Acts like an automatic site finder huh. No more time-wasted. Hmm.. great. This can make more effective time and work. can we make another toolbar too for more facilities of blogging? First off, thanks for stopping by and taking the time to share your comment. I agree this is not significantly better than the native hack you can in Firefox to achieve this. But, I think it’s just me that I can’t remember the simplest keywords I set up in my bookmarks. To look at them in the folder, I have to reach my mouse. I have become so addicted to using Enso Launcher for Windows that I am starting to like this even if I have to add an extension to it. But, I don’t think everyone has a 3GB RAM to add a lot of extensions to Firefox like I do and your points should definitely help them. I left a question about using Firefox applications with Flock last night and I came back this morning to see if you had answered and the comment was not here. Did I get spam filtered? I hope not because I like your information and would like to continue to comment. wow! This is definitely a time saver! I was looking around a similar plugin but end with speed dial. This plugin is much more powerful. Thanks for the recommendation. P.S. It seems I need establish a special page to store these shortkeys otherwise I would forget them. That seems like a great add on for people who want to make web browsing more effective. I am constantly going in and out of my email so it would be nice to simply just press a key and have it up and running.